This is ClackaCraft’s entry-level drift boat. The hull and bottom of this boat are the same as the Salmon/Steelhead Guide, Fly Fishing Bench and Weight Forward models. 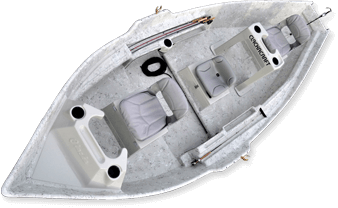 Only the interior of the boat is different: barrel bolt seat positioning system with optional seats, and the floors are not level. A lifetime of fishing pleasure at a budget price!